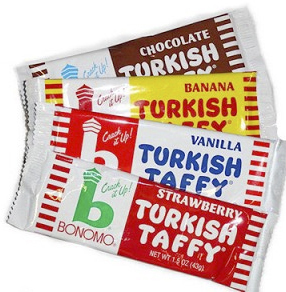 Bonomo Turkish Taffy has been around for years, in fact, I was shocked that was still produced. I purchased a vanilla bar and a strawberry bar and started my research… As it turns out, the candy went out of production sometime in the 1980’s, and just returned in 2010. If you can find it, you’ll see it in 2 sizes; big like a candy bar, and bite size. The tag line to Turkish Taffy is “Smack it and Crack it”, believe me, it’s the only way to eat the big size. Only try to bite into the big size if you have a great dental plan. For this reason I suggest the bite size. It comes in four flavors; chocolate, vanilla, strawberry and banana. Why is banana a regular taffy flavor? I don’t know. I do know that for some people it’s their absolute favorite taffy flavor. This candy has a satisfying chew, but the flavors are a little weak. I would like to taste a little flavor more in each one, but overall it is satisfying to this taffy-lover. I would buy it again. This is a very popular candy with a really long history. Check out their web site, for the whole story, and great prices, too. 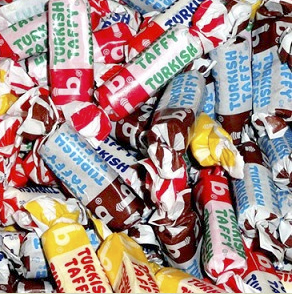 Turkish Taffy is an edible piece of American nostalgia. Posted in chewy candy, Childhood memories. Bookmark the permalink.